Okay, I'll admit it - losing graciously is not one of my strong points, and this year's Knobscorcher was no exception; I childishly sobbed myself to sleep quietly in my cabin following the race. However, later that week, as I sat home nursing my wounded arm and feeling sorry for myself, I started to wonder whether there wasn't something positive I could extract from the experience - some sort of, shall we say, silver lining to losing's ugly cloud. So I began to reflect back, way back, trying to put things into perspective. I'm not what most of you would consider a "real" mountain biker - I stumbled upon the sport quite by accident. For the first thirty or so years of my life, I was a horsewoman body and soul, who lived and breathed training, showing and caring for my horses. Then four years ago, the only life I had known came to a screeching halt when the horse to whom I had devoted the previous five years broke her leg. I lost her, and the failed surgical attempts to save her drained my finances enough to ensure no more horses for me. In my devastation, I turned to my then boyfriend (now husband), Steve, who had occasionally trail ridden with me - him on his mountain bike and me on horseback. I remember being fascinated that a bike could be ridden that way. Having grown up with ponies, I had never experienced the thrill of bike riding as a child, and always assumed that they were just ridden on the sidewalk. But with the horse life now behind me, Steve convinced me to try a new sport. So we went shopping, and at the tender age of 33, I bought my first bike - a shiny gray, fully rigid mountain bike. I was like a six-year-old on Christmas morning - my very own bicycle!!! Luckily, I had Steve to pick out a bike to fit me, as I didn't know how to ride a bike to even test one - no small feat, as I'm only 5'1", and tiny bikes are just now beginning to show up in bike shops locally here. Anyway, I won't bore you with the details of a grown woman learning how to ride. Suffice it to say that eventually, with a lot of patient coaching, I finally figured out shifting, braking and pedaling enough to ride around the neighborhood. After a few weeks of trying out my newfound skills on the pavement, I ventured off-road and fell in love. I fell a lot, got dirty and bruised, got poison ivy, hated my bike, loved my bike, but continued to ride. 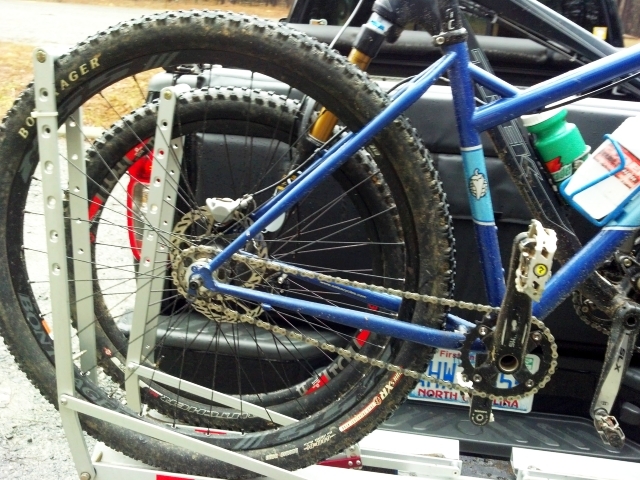 As the weeks turned into months, I bought more bikes, discovered suspension, and continued to ride nearly every day. I still never seemed to develop into a "real" mountain biker. I have always been terrified of almost everything on the trail. I tend to walk nearly as much as I ride - over logs, through ditches, switchbacks - anything that looks scary. I know other folks see me out there, still afraid to death of falling after four years on bikes, and think "what a dope", but still I'm drawn to the trail. I used to wonder why I love to ride so much, when I'm so afraid. A couple of years into my riding, I decided to try my hand at racing. Not a very successful venture for someone with such a high fear factor. I raced many times, placing usually within about two to three spotz from last, but still trying and still finishing the races. I began to get discouraged, so I stopped riding with other people, as I hated always being the last one in the group that everyone else had to wait for. I rode alone nearly every day, with only my dog, Zoe, as company - she never minded waiting while I walked the obstacles that still spooked me. Even the solitude couldn't keep me off the bike, though. What was it about this sport that drew me so? Fast forward a year. I decided to start racing again after a brief hiatus. This time, it was a little easier. I actually won a race, and started placing closer to the middle of the pack. I still walked a lot of obstacles, but I did it faster now! 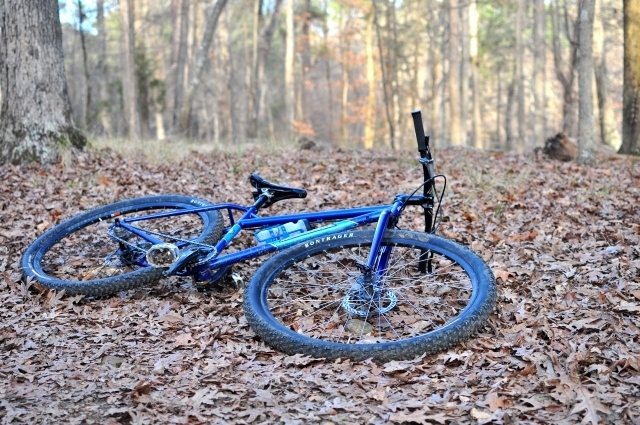 I also still rode alone most of the time, but began to try more new trails, with my ever faithful dog as my companion. 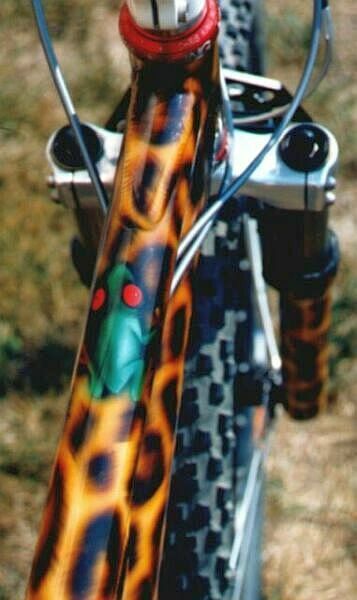 I decided to stop letting racing be such a serious drudgery, so I bought a bunch of leopard pattern clothes from Shebeest, and picked up a new Titus full suspension frame which I had painted leopardskin to match my clothes. I adopted the race name C.N. Spotz, and decided to just have fun. Things actually began to work out, as Shebeest was excited about my leopard scheme, and agreed to provide partial sponsorship for me. The confidence they put in me carried over to my riding, as I began to turn out better and better performances, even winning a 12 hour race as a solo rider. This brings us to this spring. 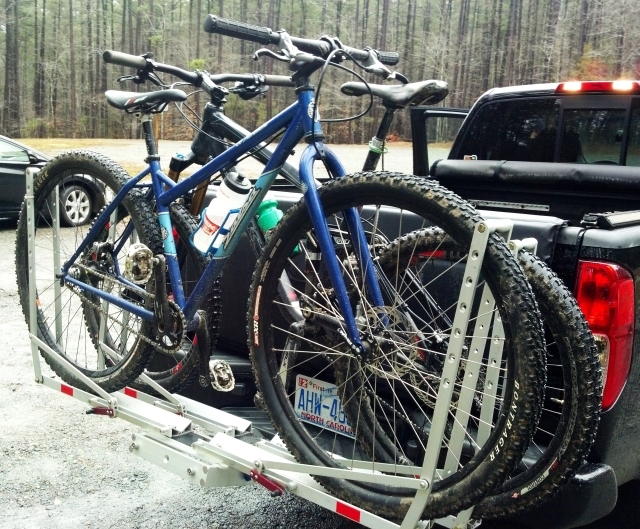 I had decided to try my hand at a big NORBA race, so I registered for the Knobscorcher at Tsali, North Carolina. I had been riding pretty consistently at home, and even attempting some log crossings that I previously was afraid to even walk. Unfortunately, the week prior to the big race, I miscalculated one of those log stacks, and fell, tearing several tendons in my right arm and hand, not to mention the gigantic wound the accident left on my psyche. Foolishly, I decided to attend the race and compete anyway, which would have probably been okay, but in my anxiety about the size of the race, I prerode the entire 18 mile course plus an additional 7 miles the day before, thus exhausting my energy reserves - not to mention the fact that I fell once again during the preride, re-injuring my same right arm, hand and fingers. Needless to say, I had about the worst race I have ever ridden, falling behind on the very first climb, a 1.3 mile trauma, with my right hand going numb after about 100 yards. I felt like old women with walkers could get up the hill faster than I could. 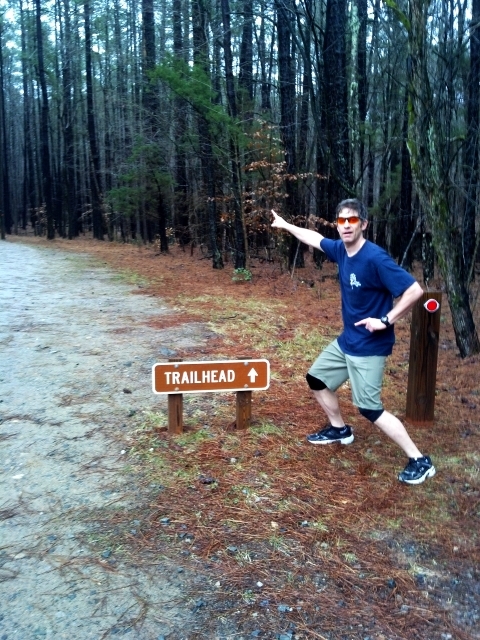 Nevertheless, I pushed on, getting passed by everyone, including squirrels, on the trail. I had originally set my sites on placing in the top 50% with a time of less than two hours. Well, out of 12 finishers, I placed 9th, but did manage to squeak past the finish line with a final time of 1:54:20. I was crushed, disappointed in myself, as I knew I could ride better than that. I cried quietly in my cabin all that night, wishing I could start the whole weekend over, but knowing that there was nothing I could do now, so I wallowed in my regrets. Several days later, I was sitting at home, cursing my wrist which still hurt some four weeks after the initial injury, when I realized that moping about, being depressed and criticizing myself about a poor race finish was such a waste of time. What had I become? Didn't I fall in love with just riding my bike? When did the competition overwhelm the sheer joy of cruising down the trail? How did the finish line become more beautiful than a deer quietly enjoying a spring morning drink from the stream that parallels the trail? I began to think about what made me want to ride badly enough to go out alone on the trails every day, and realized that it wasn't racing. It was the freedom to just ride. It was daffodils blooming along the trail edge, the switchback that I was finally able to ride without dabbing, the cool splash of water on my legs when I rode across the creek, the hill that I actually made it all the way to the top of this time. That's what made me ride, not a race that any one of a million riders could win on any given day. Does this mean that I'm hanging up my racing silks? Of course not. It just means that I've decided to keep it all in perspective. I still love to race; I still love to win. But more importantly, I still love to ride and since I still can, I guess that means that maybe I really didn't lose this time after all. As published (1999) in Fat Trax, the newsletter of the N.C. Fats Mountain Bike Club. Copyright �1999 Tammy Kaufman. All Rights Reserved. The transition from the old year to the new has been surprisingly challenging for me, if not downright difficult. For the past several days, I've been struggling with disappointment, discouragement and disillusion in a lot of areas of my life. 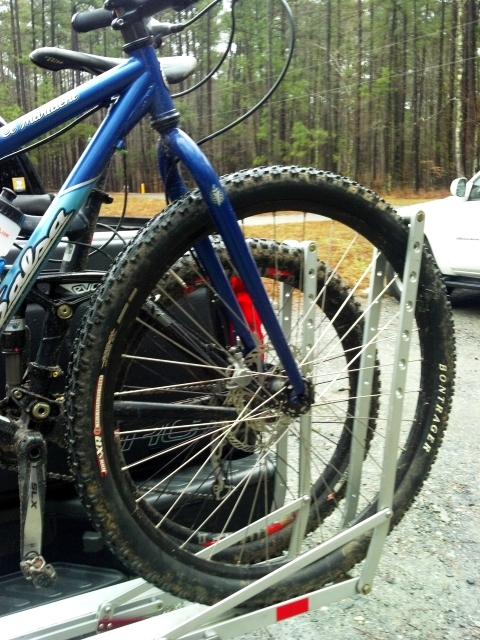 In an attempt to regain some sense of accomplishment and a much needed increase in physical fitness - which is often also associated with increased creativity, believe it or not - I decided to plan on trying to ride the hilly bridle trails at Umstead weekly, using the rigid singlespeed to help expedite strength gains. I'm finding this exceedingly tough, much more so than I expected, and today even had to walk about 20 feet of a short uphill stretch on the Main Trail which was defeating, to say the least. On the positive side, I did somehow manage to ride all of Turkey Creek though. Hopefully if I can stay on a weekly schedule as much as possible with this, things will improve on that front before too long.